This is such an easy shrimp appetizer recipe but it is mouthwatering good and special occasion worthy. It will be the talk of your next party! 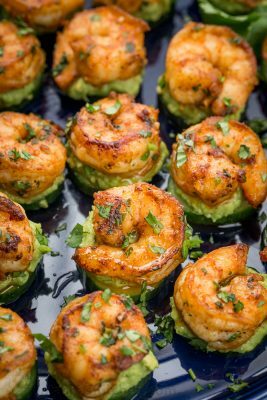 The flavor profile of these shrimp appetizers are similar to our shrimp avocado salad (one of our most popular shrimp recipes! 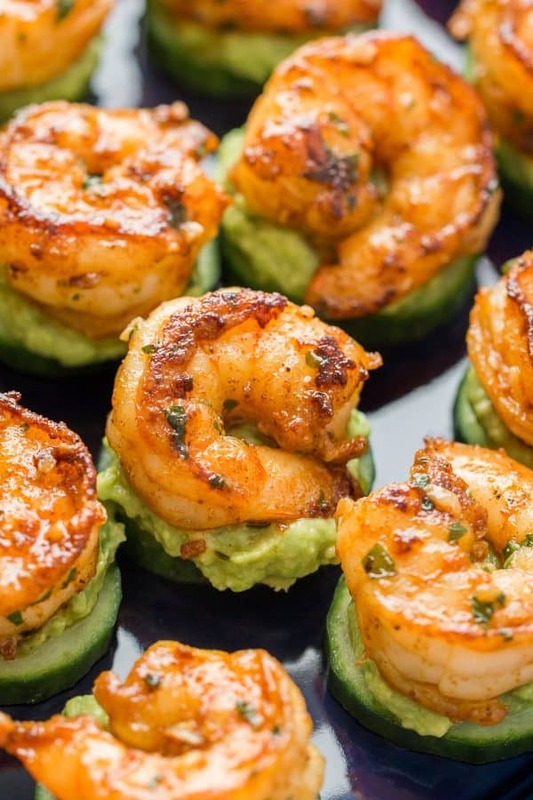 ), so if you enjoyed that, you will go crazy for these shrimp cucumber bites! My husband and son loved these! The inspiration for this recipe came from Kevin of Closet Cooking who’s blackened shrimp made my mouth water! 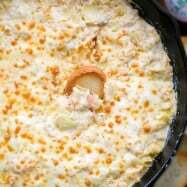 This recipe yields 20-22 cucumber bites (depending on how many shrimp are in a pound of a shrimp). The homemade cajun spice sears on to the shrimp giving it an amazing spicy kick. 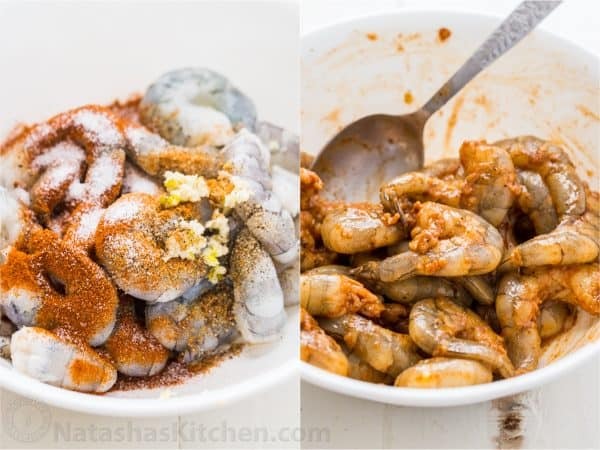 If you prefer a milder appetizer, you can easily cut the paprika and cayenne in half. I add the shrimp to the pan using tongs just a few at a time without dropping the entire amount into the hot pan right away which can cool the pan quickly. Also do not crows the pan or the shrimp will juice out and become rubbery. You want to achieve a good sear the shrimp to keep it plump and juicy. If your pan is too small to fit all of the shrimp in 1 batch, cook shrimp in 2 batches. 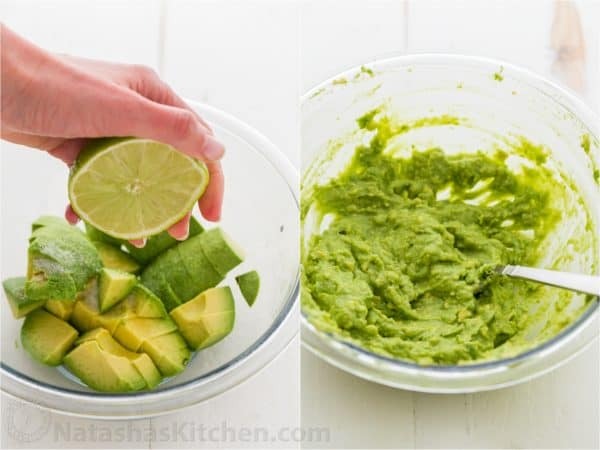 The avocado spread is so easy and the lime juice makes it taste like guacamole. 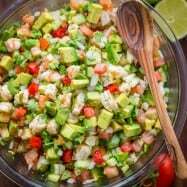 Don’t skip the cilantro and generous squeeze of fresh lime juice over the finished shrimp avocado appetizers – it ads amazing fresh flavor. This is a recipe you’ll never get tired of eating – good thing it is also a healthy appetizer with only 49 calories per bite! 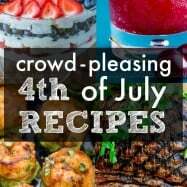 It is friendly for nearly every diet; gluten free, keto/low carb, grain free and paleo. 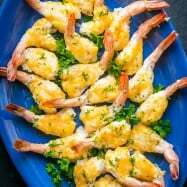 Cheesy Shrimp Bites – always a hit at parties! 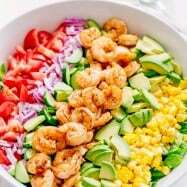 Place shrimp in a large mixing bowl and pat dry with paper towels. Add minced garlic, 1 Tbsp cilantro, 1 tsp paprika, 1/2 tsp cayenne pepper, 1/2 tsp salt, 1/4 tsp black pepper and 1 Tbsp olive oil. Stir well to combine. Heat a large heavy pan over medium/high heat with 1 Tbsp olive oil. 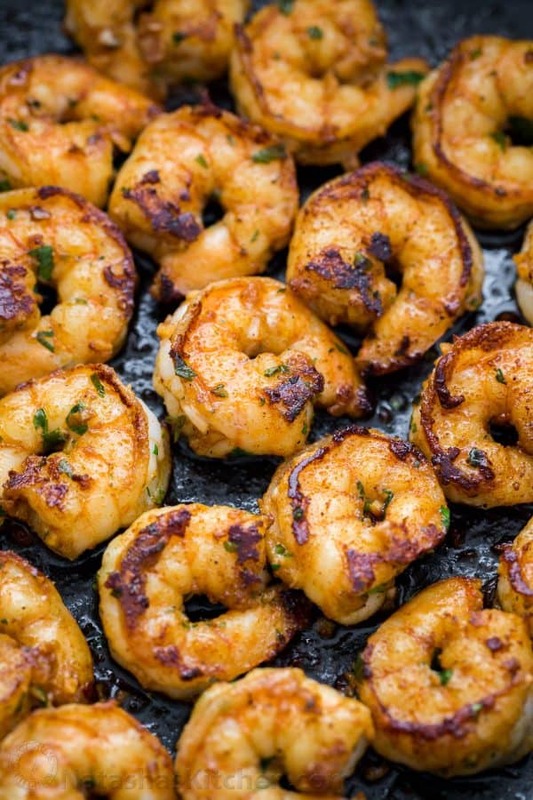 Once oil is hot, add shrimp in a single layer and sauté 2 min per side or until cooked through. 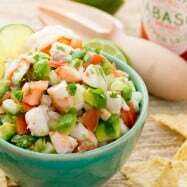 In a small bowl, mash together 1 avocado, 1/4 tsp salt and 1 Tbsp lime juice until creamy. Divide the avocado mix over 20-22 cucumber slices. 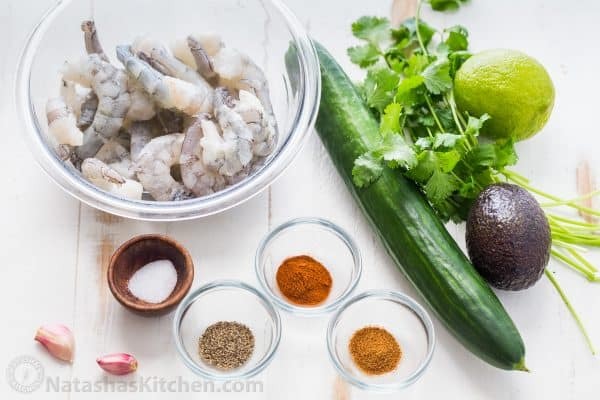 Squeeze fresh lime juice over the shrimp avocado bites and garnish with more finely chopped cilantro. If not serving right away, cover and refrigerate up to 4 hours before serving. Do you have a favorite shrimp appetizer? It’s so hard to choose just one! My friends and I would ask that you don’t use cheese so often. It’s fattening and heavy. Other than that, we love what you do Natasha. All these things together sound fabulous but… if the cucumber is sliced very thin and you pick it up with your fingers it looks to me like it is an accident waiting to happen with the avocado dropping on the floor or worse. Would you suggest a toothpick to pick it up? I can’t wait to try this appetizer. I totally enjoy your recipes and love to impress my friends. Thanks.